Monday is now our family "Try Something New" meal day. 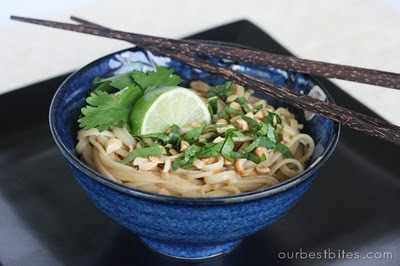 Last night we tried Thai Peanut Noodles from Our Best Bites. EVEN FROM MS. PICKY ADDIE! BONUS: It's VERY quick and easy to make! We used vegan No-Chicken Broth by Imagine instead of actual chicken broth. Veggie broth would work well too, but I've found store bought too carroty for my tastes. We also added raw bean sprouts and shredded green cabbage to our bowls which turned out to be great additions.